These are the French or big-leaved hydrangeas called Hortensias or mopheads because of their rounded form. They also bloom in pink or purple in mid-summer. I especially like to see them blooming alongside orange daylilies as the blue and orange complement each other. If you grow these hydrangeas, you need a soil ph of 5.5 or less in order for them to be blue. At 6 or higher, they will bloom pink and somewhere in the middle, purple. I have experienced all of these shades in an attempt to get the ph low enough for blue flowers! 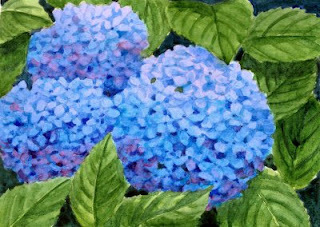 In this painting, I delineated many of the individual flowerets in each flowerhead to show the lacy beauty of hydrangeas.